The breeze felt soft and refreshing on my arms, and the generous afternoon sun warmed my face as I lay comfortably settled in one of the long chairs strategically arranged under the blossoming cherry trees in my parents’ garden; they will give a lot of fruit this year, if the starlings and robins do not get to them before the fruit is ripe. Having a nap after lunch quickly became my routine during my vacation week in France, and I wondered what I would do without them after I returned to the States. 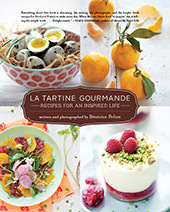 “Tu veux de la rhubarbe pour faire une tarte ?” (do you want rhubarb to bake a tart?) Madame P., one of my parents’ neighbors, asked as she walked by the house on the way back from one of her regular walks to the village. She is one of my parents’ oldest neighbors; people do not move often in the village. They are there to stay. I woke up and felt almost bad to have fallen asleep so quickly. “Ah mais oui, avec plaisir !” (I would love to) I told her without a second of hesitation. “J’en ai plein, et même de la toute jeune,” (I have a lot of it, even very young sticks) she continued on. I was thrilled. I loved when neighbors stopped by to give produce from their garden, something quite common in my home village. The rhubarb she gave me was young and tender, and I managed to make a few tartlets, the dessert in fact that we shared to celebrate my birthday en famille. Since then, I have not baked much, besides a few loaves of bread, and I have not made many desserts either. No wonder then that when I walked into the kitchen a few days ago, I was well decided to prepare a dessert, something to inspire me a little more than the fruit we’d had for dessert over the past week. Oh do not get me wrong, we really enjoyed that too, especially the cherries. I even bought a few white peaches that turned out quite tasty, to my surprise. It was time, however, for something a little more elaborate, yet not overly so. In fact, even if I like to prepare more elegant-looking desserts, it is really the rustic ones that I crave more often. The very ones that I was used to eating as a child, because they were the ones that my mum cooked regularly. Amongst those, the summery winning ones were always rhubarb tart, because we had so much rhubarb that we literally did not know what to do with it, and cherry clafoutis because of all the cherry trees my parents have in their garden. P. did not dare tell me but I know he missed my desserts. So when I walked into the living room after dinner and told him I had a nice dessert for us, he looked up at me, his eyes expressing high hope for something quite special. I wanted the clafoutis to be a bit more tangy and vibrant than a traditional cherry clafoutis. I wanted it also juicier, so I needed a fruit suited for that matter. And I thought about adding raspberries for a contrast in taste and color. I imagined that a rhubarb clafoutis might be a bit boring looking, even if always tasty. Adding a little red would not hurt. It proved a really great association of flavors, pleasing to the taste and the eyes. I bought thin sticks of rhubarb, a sign that the fruit was young and tender, and barely needed to be peeled — the way I always prefer to buy it. Beside leaving the rhubarb sprinkled with sugar to rest for an hour to release some juice, this dessert recipe suited me well: quick, hardly any work involved, for an inviting delicious dessert to indulge in without restraint. We sat down after dinner and did not feel bad for a second for having finished the dish between only the two of us. That’s how we like our desserts, don’t we? Fruit, milk, a little sugar and flour: only good things to please the senses and make us enjoy spring and the summer-that-is-to-come. Before we notice it, there will be Apricots. Frankly, I cannot wait. Can you? Place the rhubarb in a colander and sprinkle with 1/4 cup sugar. Let rest for 1 hour so that it releases some juice. Preheat your oven at 400 F.
In a large bowl, beat the eggs with the sugar (use your Kitchen Aid stand mixer if you have one). Add the cornstarch and tapioca flour and mix until homogeneous. Slowly add the milk and cream, until the batter is smooth. Arrange the fruit, rhubarb and raspberries in a greased oven dish, and pour the batter over. Cook for about 30 to 35 min, or until golden in color. Remove from the oven and let cool a little before eating. Sprinkle with confectioner’s sugar. Best eaten lukewarm, in my opinion, but you can also enjoy it cold, especially if packed with you on a picnic. Mettez la rhubarbe dans une passoire et saupoudrez-la de 50 g de sucre. Laissez reposer pendant 1 heure pour qu’elle rende un peu de son jus. Préchauffez votre four à 200 C.
Dans une grande jatte (utilisez votre mixeur à pied Kitchen Aid si vous en avez un) battez les oeufs avec le sucre. Puis ajoutez la maïzena et la farine de tapioca pour obtenir une crème homogène, sans grumeaux. Ajoutez doucement le lait sans cesser de battre, puis la crème, pour avoir une pâte bien lisse. Arrangez les fruits, rhubarbe et framboises, dans votre plat à gratin graissé, puis versez la crème sur les fruits. Cuisez pendant environ 30 à 35 min, ou jusque le clafoutis soit doré. Sortez du four et laissez refroidir avec de déguster. Saupoudrez de sucre glace. À mon avis, c’est meilleur mangé tiède, mais vous pouvez décider de le manger froid, surtout si vous l’emportez avec vous au cours d’un pique-nique. Just about as lovely as idea of napping beneath a blossoming cherry tree in France. Très très tentant ce joli clafoutis ! je ne dirais pas non a une portion de ce dessert…. Petite question : ou as-tu trouve ces jolies petites cuilleres ? It is the outdoor birthday party of my young nephew next weekend. I should bring this clafoutis as a dessert surprise. WOW! Your clafoutis looks delicious!! Looks delicious, Béa. Can you imagine, I only recentlly baked something rhubarb for the first time, a strawberry rhubarb strudel. Really good. I love rhubarb! Gorgeous colors Bea! That photo of the rhubarb with the leaves… I love it. Clafoutis is perfect for this time of year because stone fruits are so abundant. I have been baking away with cherries, apricots, peaches… you name it. And afternoon naps right after lunch… so nostalgic! I’m just about to make an apple clafoutis for our Sunday brunch, but now I’m so wishing it was a Rhubarb and Raspberry one… too beautiful! That is a PERFECT clafoutis! The colours remind me so much of summertime (which we really need down here in Australia)! mmm, clafoutis! I think I will make some. I love this plant. Pliant, strong, tangy and resilient! Growing up, I remember my mum picking it from our garden- along with her herbs from her vast herb garden. I will try this next week! What a great looking clafoutis! Fantastic photos as always! It looks so fresh and summery. The rhubarb and raspberries are a wonderful pairing. All sorts of gorgeous Bea. What a great take on calfoutis! 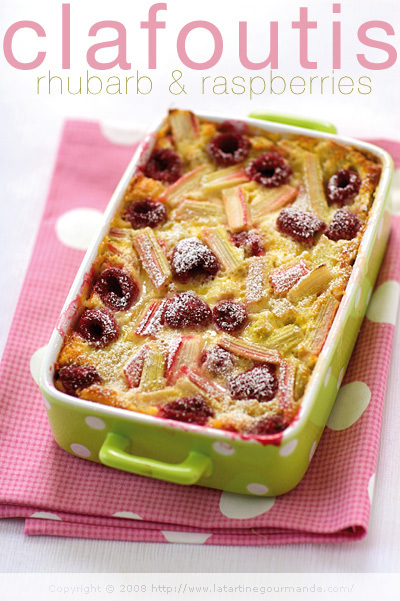 Rhubarb is a favourite of mine, as is clafoutis so I’ll be trying out a version of this soon. Just beautiful with the raspberries too. C’était la semaine des clafoutis à la rhubarbe! J’en ai aussi fait un mais sans framboises chez moi, ce sera pour le prochain. Bea, I just discovered Clafoutis a couple months ago – and LOVED it, and so did my hubby. We Americans have seriously been missing out on a very, very good thing. I made mine with blueberries – and we had it for breakfast. Incredible!! Plus, so easy to make, I couldn’t believe it. Cherry and plum clafoutis is lovely… But this – This had to be beyond perfect… I’m in serious clafoutis envy here! And that lovely rhubarb… Sigh! Looks amazingly delicious and so beautiful. But I MUST ask… where did you ever find that GORGEOUS polka dot baking dish?? Oh my, this looks SOOOOOOOOO delicious!!! I have to try this. I had never been into rhubarb, not sure why, but had it in a dessert one night at a restaurant and have been looking for the perfect recipe to test cooking it for myself. Thanks for the inspiration. Super cette recette! J’ai moi-même testé (et approuvé!) le mélange rhubarbe-framboise récemment. Tous les ans chez toi, on retrouve la rhubarbe, et c’est toujours aussi tentant. I would be happy in a place where I could nap outside under the cherry tree and have a neighbor walk by and offer me some rhubarb (or anything else from the garden). It sounds like heaven! The rhubarb clafoutis is definitely something I will try. Hello! I don’t have to wait for apricots because they are already here in the Algarve (Portugal). Yum!!! !I’m only waiting for your recipies. Can’t write much that has not been said already so, I’ll keep it short: Heavenly. The photos are sensational! and I love that baking dish! I cannot believe I have been missing out for so long on rhubarb. I just made cobbler with rhubarb and strawberries and I loved it. I will definitely be giving this recipe a whirl. Great pix by the way! 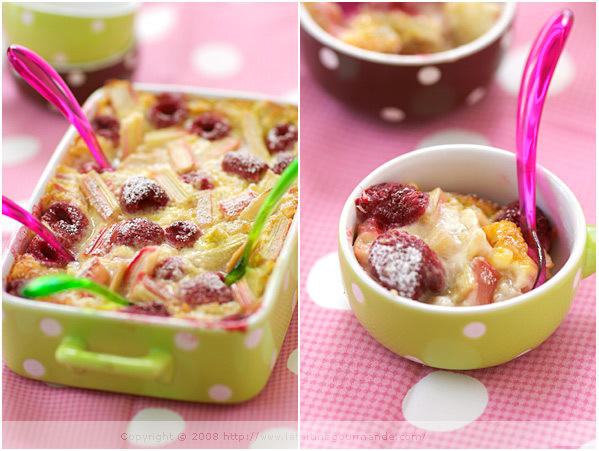 Rhubarb & raspberries together in a clafoutis.. totally “to die for”! Once again, many thanks everyone for your visit! I hope you enjoy the association of flavors as much as we did. P. is already begging for more. Such a short move away from all the strawberry/rhubarb combinations out there but for some reason this seems way more appealing to me. And who could resist the polka dots?! Clafoutis seem to be popping up all over right now. Your’s looks gorgeous! I just happen to have some rhubarb in the fridge wanting for the perfect recipe…I think this is it;) Love the polka dots!! Très beau. Je pensais que ta photo était celle d’un nouveau livre publié chez Marabout. Tu as raison, rien que de la rhubarbe, c’est un peu tristounet. Toujoura beau chez vous, madame! Looks delicious! 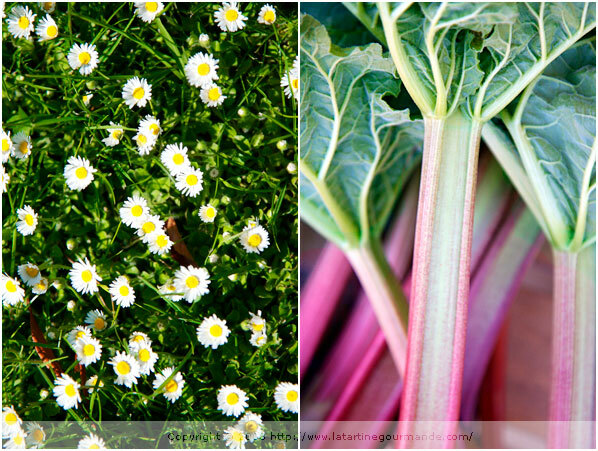 A great combination of flavors…but impossible to find rhubarb in south Italy! 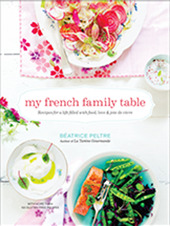 Merci Bea, I tried this recipe today. It’s delicious, texture just about right. We loves rhubarb and raspberry for desert. This is obviously become our fav. wow, this is a lovely recipe, you have such a beautiful food blog, i just got here while looking for some recipes for my red currants. i just don’t know what to do with them, i just moved to a new house with lots of bushes. but the rhubarb is also good because i also got them in my garden. will be coming back for more recipes. maybe you also have some tips for me for my red currants. i don’ know what to do with them..
Pingback: En Amour: In pursuit of beauty. i was looking for raspberry clafoutis and i stumbled to your blog..your blog is sooo beautiful i will come for more..have a blissful day! I just made this without the raspberries and it looks and tastes great! It was super simple 🙂 I substituted the maizena for more flour, because I didn’t have any. I made this clafouti for a dinner party, thrown together as people were walking through our front door (actually our back door, due to porch construction). Delicious and so dead simple! The tapioca flour gives it such a trembling tenderness. oh yum! Where in the name of the wholly clafouti do you find rhubarb in Washington? That would be such a tummy saver! hi! i’m new to your blog (loved & read your book cover to cover when i received it as a birthday gift a month or so ago). can i use almond milk instead of regular, do you know? Béa, this clafouti was gorgeous and simply delicious. I made it last night to start our work week off right! Desserts like this and many others you make are the best because they add nutritive value while also being indulgent. Thank you for sharing such uplifting and inspiring treats!